We understand that sometimes it is preferred to spread the cost of the procedure, and to make this possible for our patients, we have teamed up with Omni Capital Retail Finance. Financeis Subject to Status and application must be made in person at our clinic. Am I Eligible to Apply for Finance? Are a UK resident and have lived in UK for at least 3 years. Have a UK bank account with a Direct Debits facility. You can apply for a range of interest-free and interest-bearing finance options to help you spread the cost of your procedure over 12, 24 or 36 months. Applies to both Surgical and Non-surgical procedures with a value of £1000 or more. Applies to Surgical procedures Only. 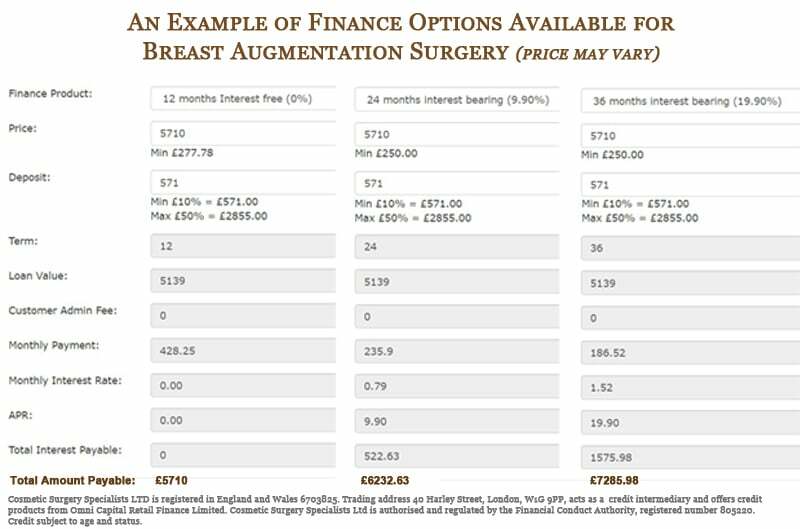 Here is an example of the various finance options available for Breast Augmentation surgery or any other Surgical Procedure. It usually takes no more than 10 minutes. You will need to bring your passport for ID purposes and bank account details for the Direct Debit set-up. Your application is assessed, and a decision made within seconds. Once approved, you pay your deposit to complete the application. Your payments will start 30 days following the completion of your surgery. or 30 days after you pay the deposit for your non-surgical procedure. Our Finance partner, Omni Capital Retail Finance Limited, will provide you will all the documentation related to your loan and they will be the point of contact for any finance related questions after your finance is in place. With dedicated customer service team available 7 days a week. There is a 14-day cooling off period where you can withdraw from the credit agreement after paying the deposit and completing the finance agreement. If you wish to CANCEL your finance agreement, you need to notify Omni Capital Retails Finance Limited within these 14 Days. A finance payment plan Does Not affect our standard cancellation policy. In a few cases, your application may be referred for manual assessment and you’ll be notified by email of the credit decision within 24 hours. If you’re not approved for finance, it could be for a variety of reasons and Omni Capital Retail Finance Limited will be able to provide you with further information. If you have any further queries regarding finance or want to know our guide prices for any Surgical or Non-Surgical procedures please Call +44 207580 8001 or email us, and we would be happy to assist you.